not want your recordings to get lost. It is best to define a new project before starting to record. Choose menu File ? New project for recording LUCI will then ask you for a name that will be used for the recordings. For this example the name ‘default’ is chosen. Now Go Live by tapping the MIC-button. The time-indicator will start to run and the name besides the Record-button will be the file you are recording. If you press the Record-button again, recording stops. If you then press the Record-button again, recording continues in the same file as before. 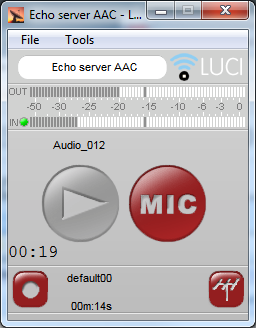 Only if you deactivate the MIC-button, this recording will be closed and the filename increments to default01 to indicate the new filename you will record the next time. You can also record without broadcasting Live: Press Record and then Mic or vice-versa.